The average cost of a wedding in Canada (according to this 2015 survey) is over $30,000. That’s a lot of money. And here’s the kicker: 75% of couples expect they will go over budget. How does this happen? Well, let’s look at how one item – just one – ends up costing way more than expected. The item? Your wedding dress. Here we go. Destination weddings? Honestly? I’m not a fan. Yes, I can see the appeal for the bride and groom, but for your guests? Not so much. Asking family and friends to fly off to an exotic destination that they might otherwise have no interest in visiting is asking a lot. Not to mention the demands on their budgets and precious vacation time. Good News: there are countless “destinations” close to home that will satisfy your desire to get away, but won’t annoy or bankrupt your guests. Join me on a little road trip as we visit my Top 5 Ontario wedding destinations. Why? Ontario’s Napa Valley is often called the prettiest region in the country. Dotted with lush vineyards, bursting with history and boasting more charming venue options per square foot than just about anywhere in the province, it might be the perfect location for your Destination Ontario wedding. Venue: Ravine Vineyard A bucolic setting amongst 34 acres of vineyards. Delicious farm-to-table cuisine. Dancing under the stars. C’mon. Weddings don’t get much more perfect than this. If you think saying your vows in front of a crowd will be nerve-wracking, have you thought about dancing in front of a crowd? No pressure. Hahahaha. The first dance is a relatively new tradition and it serves one purpose: to kick off the post-dinner festivities. You know when you hear an artist for the first time and they just stop you in your tracks? Chloe Albert did that to me when I discovered the Edmonton-based artist on CBC radio a few years ago. I have both of Chloe’s CDs and think this song, from her debut Dedicated State, is a perfect first dance song. I hadn’t heard of Boston singer-songwriter Chris Trapper until I saw Chloe Albert (see above) performing her cover of this song on YouTube. Chloe’s version is lovely, but this, the original, has my heart. This song was written by The Boss himself, Bruce Springsteen and is featured on East Coast singer-songwriter Rose Cousins’ album We Have Made a Spark. Sorry Bruce, but I think Rose Cousins’ heartbreakingly beautiful version blows yours away. I couldn’t find that album version on YouTube. This live recording is good, but I suggest you try to find the album version on iTunes. The first dance is always a highlight moment of any wedding. I’d love to hear about your song selections. How did you select your first dance song? Did you choose a little-known song for your first dance or a classic? Let me know in the comments. I may feature some of your choices in a follow-up post. Now don’t get too excited because my first and best advice to you will always be HIRE A PROFESSIONAL!!! I’ve seen too many brides and grooms underestimate the DIY details. That said, if you are creatively inclined and think you may want to DIY some of your wedding florals, I highly recommend getting some basic instruction. Here are a few options to consider. Toronto Botanical Garden – TBG offers a variety of floral design courses, some of which can be applied to a Floral Design Certificate. Costs range from $90 – $186, with a discount offered to TBG Members. Canadian Institute of Floral Design – beyond their certificate program, designed for those interested in a career in floristry, CIFD also offers evening courses that focus on different aspects of weddings and events. Retail Florists – many florists offer their own in-house workshops. A few to consider: From The Potting Shed in Cambridge, Blush and Bloom in Toronto, Lilium in Caledon. Seneca College – offers a certificate in floral design at their Newnham Campus location. From flower selection to prep to actual assembly, creating beautiful wedding florals is a lot more work than most people realise. A bit of training will go a long way to help you create DIY florals that are a joy, and not a crazy-making last minute chore. I’m delighted to see my lovely waterfront wedding featured on The Wedding Opera. The ceremony and cocktail-style reception took place at the iconic Henley Room at The Argonaut Rowing Club on a sunny, but chilly, spring day. My bride and groom wanted a casual, yet elegant wedding that celebrated their love of family, friends and good food. Caterers Fidel Gastro’s delivered with creative passed canapes and food stations that are best described as upscale-street food. And delicious. Did I mention the food was also delicious? The love and yumminess was captured beautifully by Jessica and Jason Hill of A Brit and A Blonde Photography. All that’s left for you to do is feast your eyes and enjoy. It was a tough battle between David Austin roses and peonies. Ultimately I weakened and chose both. Each is at its best in the month of June. Each flower is the epitome of summer romance. And each is so lovely that choosing one over the other was simply impossible. Both roses and peonies claim to be the “Queen of Flowers” but let’s leave that discussion to another time. You’ll note that I did not select all roses (too easy), but homed in on what I consider the most exquisitely beautiful roses available: David Austin roses. These beauties feature many layers of intricate petals and are often fragrant – a feature not often found in commercially grown roses. (The scent is deliberately bred out of the flowers to broaden their appeal.) Not every florist carries David Austin roses in their daily inventory so make sure to let him/her know that you’d like to include these special blossoms when getting your quotations. You would think flowers as gorgeous as peonies would be delicate. But not only are they beautiful, they are tough. Long lasting – some varieties will live close to 100 years – peonies are easy to grow, drought tolerant and disease resistant. In my own garden we have three peonies that must be at least 40 years old. And every summer they bloom abundantly, without fail. Look at these beauties. Resistance is futile. This week wedding industry pros were surprised to learn one of the most popular and respected barn venues in Ontario is temporarily shutting their doors pending permit issues. (They are offering a tented option until they can re-open the barn space.) This situation reinforces the fact that you, as the consumer, must do your due diligence. Legitimate barn venues are inspected regularly and must meet very strict health, safety and fire code guidelines. The tiniest infraction can mean they lose their permits. And when that happens the bride and groom are suddenly left scrambling to find a new venue. Wedding planning is stressful as it is. Can you imagine having to suddenly find a new venue just weeks before your wedding? When searching for a barn venue don’t be afraid to ask the tough questions. All permits should be visible. If they aren’t, ask to see them. And do not – EVER – sign on to have your wedding in a barn that is being rented out privately. If a legitimate barn venue can have its wrists slapped while they get their permit issues in order, you can only imagine how local authorities will come down on a private barn. Not only do you run the risk of losing your venue, but a barn that doesn’t meet local health, safety and fire codes puts your guests at risk. Having done a few barn weddings (and with two more planned for 2017) I’m well aware of the challenges. Avoid disappointment – or worse – by doing your homework and work with a wedding planner who is familiar with both the charms and challenges of barn venues. I posted this originally in late 2012 but the message is timeless. 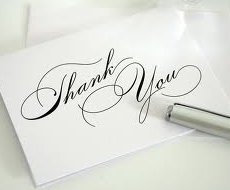 The power of saying thank you and expressing your gratitude cannot be overstated. Two words. A simple phrase. But, oh, so powerful. Recently I contributed a generous donation to a deserving fundraising event; something I’ve supported for years. The event itself was weeks ago. Have I received a thank you for my contribution? I think you know the answer. As a newly engaged couple you are going to be wined, dined, celebrated, showered and, most important, married. People are going to wish you well, give you gifts, shelter your out-of-town guests, take time out of their own busy lives – sometimes at great personal inconvenience and expense – to help you celebrate your happy and important milestone. At the very least – the very least – these people deserve a proper thank you. Contrary to popular myth a newly married couple does not have a full year to send out thank you cards. The Emily Post Institute recommends three months following receipt of the gift. Many etiquette specialists (and I agree with this) say thank you cards should go out within three months of the wedding, regardless of whether or not a guest has sent a gift. Every guest deserves the courtesy of a proper, personal thank you. Remember, people have taken time from their lives to join in your celebration. If a gift should arrive after the thank you card has been mailed, send a second card as soon as possible, acknowledging their generous gift. Many couples like to include a photo with their thank you cards. A lovely idea as long as waiting for your photos to arrive isn’t pushing your thank you timeline into “rude” territory. If you haven’t received your photos within the three-month timeframe send out your thanks without the pictures. You can always include the photo in a Christmas card. And, for the record, distributing pre-printed stock thank you cards to every guest at the wedding is not appropriate. Expressing the words “thank you” is a very personal expression between you and your guest. Pre-printed cards are simply rude. Sending a proper thank you is the right thing to do and your guests will be very appreciative of this simple, but thoughtful gesture. Take the time to do it properly. Click HERE to learn more about the etiquette of the thank you card. Look familiar? This was the BIG TREND in wedding photography a couple of years ago. Or, how about this? Yup, nothing says “special day” like a photo of the groom dumping muddy water over his beloved’s head. Trash the dress? I say trash the goofus who came up with this silly idea. Colour bombs. Yup. Colour bombs. Why is this a big trend? I don’t really know. Because people need to follow trends? Even when they’re silly? Because you, your beloved, your wedding party and nature aren’t already beautiful? Who knows. In preparation for this post I reached out to three of my favourite wedding photographers: Jennifer Klementti, Lisa Mark and A Brit and A Blonde. All are well established, highly respected professionals. When I asked each to comment on wedding photography trends they all had very similar responses: Ummmm, let’s just say none of them are fans of fads and trends. What they ARE fans of: capturing the authentic emotion of the day. Jennifer, Lisa, Jason & Jessica (the aforementioned, Brit & Blonde) and every other quality photographer I know, actively avoids the trend du jour. What the good photographers want to do is capture the genuine and fleeting moments – a smile, a tear, laughter – and give you images – and memories – that will stand the test of time. Trends come and go. And they go for a reason. Like the bridal party in the first image in this post, run as fast as you can, from silly photography trends. It looks like spring is finally here – and not a moment too soon. The drab winter landscape will soon dazzle us with colour as gardens and trees burst into leaf and bloom. Spring is such a happy season. It’s the season of renewal, rebirth and rejuvenation. Optimism and hope abound. Is it any wonder that May officially kicks off wedding season? And what better flower to feature as our Wedding Flower of the Month than Lily of the Valley? According to floral mythology, when Lily of the Valley blooms, happiness returns. It is also believed that Lily of the Valley brings luck in love. I can’t imagine a more appropriate sentiment for your wedding day. Catherine Middleton carried a beautiful, delicate bouquet when she married her Prince William five years ago. (Can it really be five years? Really?) This pure white beauty was the epitome of springtime loveliness. Florist Shane Connolly used lily of the valley, Sweet William (of course), stephanotis and hyacinth to create a deceptively simple design that expressed Kate’s desire to celebrate the spring season and the bounty of locally grown flowers. If all-white is not your style, here’s a pretty teardrop-shaped bouquet featuring Lily of the Valley and blue hyacinth florets. The (small) downside to Lily of the Valley? These sweetly fragranced, delicate beauties are highly toxic so this is one bloom you will not want adorning your wedding cake. Lily of the Valley is only available for a short time in May, but nothing says springtime more beautifully. Click here for more behind-the-scenes details on Catherine Middleton’s exquisite bouquet.